Please click in this index and also see what is new in the icons theme above! New countries flags (in development)! Suru++ is officially compatible with with @actionless's Oomox. You can change any colour of all 16px icons and of all folders once in a while! ✱ Added new 13 icons with alternatives, developed by @iLynux8888.. This current version is entitled Nantes because it was where Outrun of 1980s, and 80s and 90s eurodance, electro and techno events have happened in Nantes. As Suru++ is cyberpunk, futuristic and modern, Nantes, earth of Outrun, is symbol of cyberpunk retro-futurism. I inform you all that Suru++ supports gradient colours for 16px icons, allowing you to change with your favourite colours, using Oomox and Suru++ Colourise, and it also won new three colours of folders. The next versions will be entitled after cities of different countries where 80s and 90s summer cyberpunk and retro-futuristic designs were important. All the former versions were renamed after Italy cities, in hommage to the original author of Suru++ Ubuntu. I have the same problem on Arch - when i select Suru++ it reverts to Hi-contrast theme. Please see if it works for you with the update. I found a bug now. It is in the theme `index.theme`, which missed `=` in the Greek translation. Magog64's SURU PLUS works flawlessly on my ubuntu 18.10, but not this theme. I wish there is a fix. I have fixed the bug. It was in the index.theme. Please see if it works for you with the update. Thanks a lot. Its fixed indeed. Not working correctly in Ubuntu 18.10. After applying the icon theme, all of the icons in ubuntu turns into archaic and ugly looking ugly icons. How to fix this? It is in the theme `index.theme`, which missed `=` in the Greek translation. Today I will update now. Hi tejoenardo, how did you install the icons theme? With Oomox? I installed it using the CLI command in your repository page. It is icon cache bug. I already try to clean the cache using stacer then logout. The problem still persist. It can mean the new version of Suru++ did not overwrite the old version of Suru++. Did you install the old version of icons set somewhere? Please, can you screenshot this? So I can figure what caused. ✱ New three colours of folders – indigo, Manjaro-coloured and pink. ✱ Gradient colours support, compatible with Oomox and Suru++ Colourise. ✱ Inaurgation of the Suru++ site and blog. 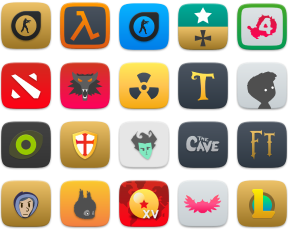 ✱ Added 55 new icons. ✱ Now all the old and new versions are entitled. 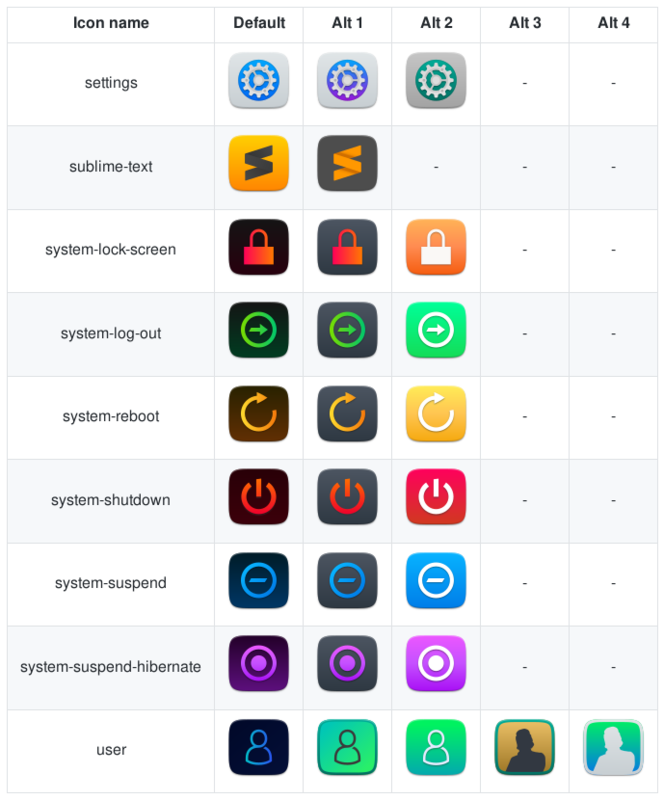 ✱ New alternative icons of session and of Sublime Text, redesigned by @darcn181. ✱ Officially compatible with Oomox. ✱ From 4,700 to 5,200 icons. ✱ New translations and upgrade in the file "index.theme". ✱ Fixed missed KDE media controller icons. ✱ Fixed symbolic session icons. ✱ The trash icons and the wrong session icons have been corrected, fixed and modernised. ✱ Increased 2,2 thousands to 4,7 thousands icons! 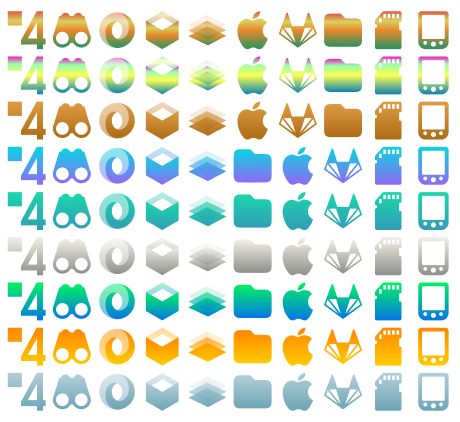 ✱ The 4,7 thousands icons have been cyperpunkished, modernized and papirusified. ✱ Linux Mint-coloured folders have been added. ✱ Nautilus, Nemo and Thunar designed by Pavel V. Dimens. ***✱ Deleted the executable bit from files for security issues. ***✱ Fixed icons with rendering issues on old systems. ***✱ Removed some broken symlinks. ***✱ Removed all Gravit Designer base64 and metadata which caused rendering bugs. ***✱ Reduced from 175MB to 110MB! ***✱ The Suru++ 20 grey icons (actions, emblems and status) have been replaced with Papirus colourful and monochromatically desaturated-grayish-blue icons. The colour of too others (apps, mimetypes and places) has been replaced. ***✱ New countries flags (in development)! ***✱ More than 50 Flatpak icons and other 20 icons have been added! Check the list here. Fix several symlinks in "places/scalable"
Correcting the misspelling of an icon to get well displayed. Fixing the missed directories "extensions", "log" and "plugin" in the file "index.theme"
Thanks to @bzhmurov for adding the Belarusian, Russian and Ukrainian translations in the file "index.theme". +The best ever, i love it. + Pretty good - very pretty... needs some tweaking to match folder icons to my theme (hacked Ultimate/Equilux in powder blue) then it'll blend perfectly. + Love it! Really refreshing. +It´s cool! BEAUTIFUL icon set!!! +Thank you for adding Focuswriter! +I use this icon and it suits well with PRO-Dark-XFCE-Edition theme by paulxfce. The download link is however obsolete as it contains version 3.0 instead 3.1. + Impressive work! Works well on Plasma 5 - Wish the smaller sized icons either use the default, or the smaller sized version of the Suru icons. Please replace the grey-scaled versions. + Discord has rare white borders. Thanks for your work! Thanks for your support of different distros. I always look for icon theme that can be used across (at least) main favorite distros. Thanx again. Giving plus and a pling.